Although guinea pigs are small they are one of the largest rodents kept as pets and need a lot of space to run around, explore and exercise to keep them happy and healthy. The minimum cage space required for one guinea pig is 70 square centimeters or 7.5 square feet, as this will allow for enough space for everything they need as well as room to run and play. Due to territorial reasons, male guinea pigs require at least 1 square meter of cage space to prevent fights and distress between your pets. A small cage may lead to stressful situations for your furry friends, and can affect the overall health and happiness of your guinea pigs. One Guinea Pig: 76cm x 91cm or 0.7sqm. It is recommended that guinea pigs are housed in pairs and should only be kept alone after getting advice from a professional who specialises in exotic pets and rodents. Two Guinea Pigs: 76cm x 127cm or 0.7sqm – 1sqm. Three Guinea Pigs: 76cm x 157cm or1sqm – 1.2sqm. Four Guinea Pigs: 76cm x 193cm or 1.2sqm – 1.3sqm. If there are four or more guinea pigs housed in one cage it’s recommended that the cage is as large as possible. 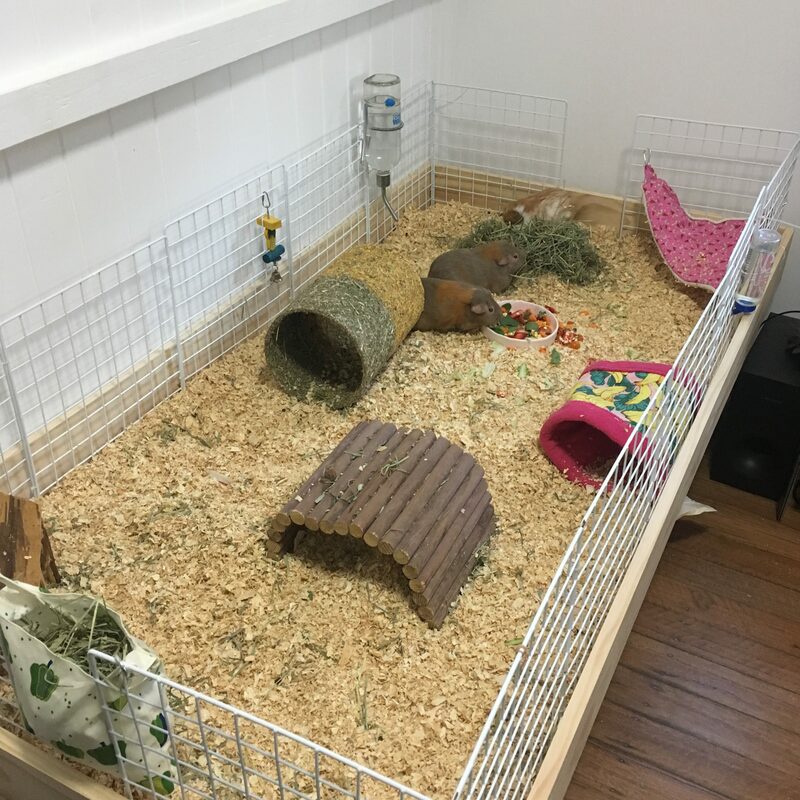 Exercise: Even if floor time is provided everyday and may seem like enough play/exercise, guinea pigs can be very active at late night and early morning hours so having a large cage will allow your pigs to run and play as they please. Exercise for guinea pigs is very important, as an overweight guinea pig can lead to health problems including heart disease, bladder infections, respiratory problems and more. Stimulation: Guinea pigs are curious and intelligent animals and enjoy playing with food puzzles and toys. 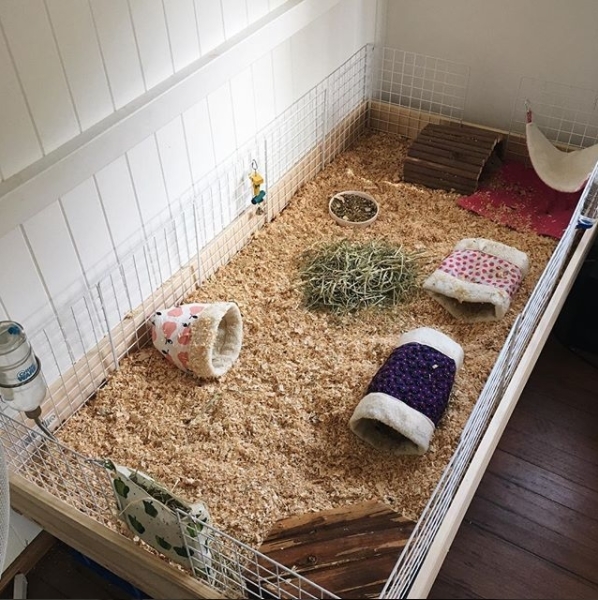 A large cage will provide enough space for exploring, sleeping and playing which will prevent your guinea pig from becoming bored, and even depressed. Your cage should have enough space for access to hay (a sack for example), hidey holes, water, toys and treats for stimulation. Comfort: Even though piggies can become very trusting of their owners, they are still prey animals and like places to hide when they want to relax. Fleece tunnels, hideys, and sacks are great toys for guinea pigs as they provide both stimulation and comfort. Guinea pigs should always have a hidey to retreat to in case they feel threatened or scared in anyway, and love to relax in hideys as they will naturally burrow. Socialisation: Guinea pigs are very social animals and therefore need a lot of room to socialize and play. Guinea pigs also need space when they don’t want to be social anymore, and a large cage will help provide space for sleepy guinea pigs. Happier Guinea Pigs: With enough space, socialisation and stimulation, your guinea pig will be very happy and more trusting of you. Guinea pigs are intelligent and loving animals and having a happy guinea pig will be much more of a rewarding experience for everyone. When comfortable and happy, guinea pigs are very trusting animals and love to cuddle up to humans. They’re also smart and can learn lots of tricks, just like dogs! Be sure to be patient with your guinea pig, they will learn to trust and love you if you show them you’re willing to love and care for them first.